How much does the American Dream home cost? From $2 million in Los Altos, Calif., to $65,000 in Cleveland, here's what you'll pay for a 4-bedroom, 2-bath house, according to Coldwell Banker's annual survey. 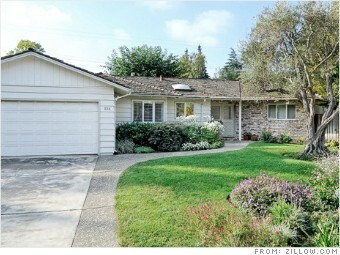 As far as prices go, Northern California homes are in a class by themselves. And in the aptly named Los Altos (or "The Heights"), one of the most exclusive Silicon Valley communities, prices are still skyrocketing. This 2,117 square-foot home, for example, was initially listed for just under $2 million. But then a bidding war sent the value soaring to $2.2 million. This ranch offers large, well-lit rooms and sits on less than a third of an acre of land. Nice touches include plantation shutters, beamed ceilings and a large patio area.